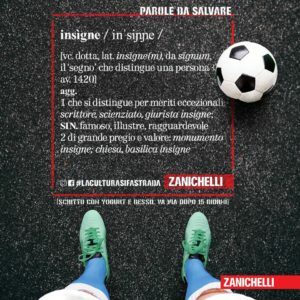 Editors at Italy’s Zanichelli Publishing House launched a campaign to revive Italian words that have fallen out of use, by painting graffiti with the words and their definitions onto city streets. The campaign, marked with the hashtag #laculturasifastrada on social media, aims to bring attention to the complexity of the Italian language, which has become more simplified in the digital age. The editors came up with a list of 3,125 endangered words, and chose five of them to be featured in the graffiti: bòria (n., haughtiness, conceit); denigràre (v., to denigrate or disparage); insìgne (adj., distinguished, eminent); solèrte (adj., diligent, zealous); and corroborare (v., to corroborate or strengthen). Four cities – Turin, Milan, Naples and Padua – are each decked out with 50 pieces of the graffiti on streets and sidewalks. The paint, made with yogurt, is environmentally friendly and can be washed off. According to The Local, the editors said that the graffiti provides “opportunities for reflection on our capacity for expression.” They also noted that painting the words on the sidewalks is purposeful, as it will catch the attention of people looking down or looking at their phones while walking.